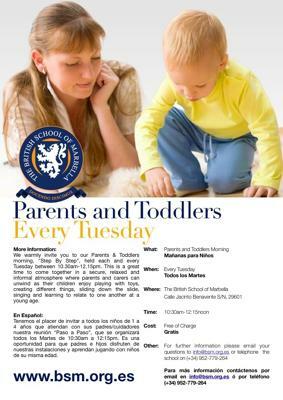 We warmly invite you to our Parents and Toddlers morning, "Step by Step", held each and every Tuesday between 10.30am-12.15pm. This is a great time to come together in a secure, relaxed and informal atmosphere where parents and carers can unwind as their children enjoy playing with toys, creating different things, sliding down the slide, singing and learning to relate to one another at a young age. Depending on the weather, we have full use of the outside areas with slides, sandpit, playhouse etc. Light refreshments are provided and best of all, it's free! We look forward to welcoming you at the British School of Marbella next Tuesday. Please feel free to contact the school for more information on info@bsm.org.es or 952 779 264. I am the mother of a 16 month old and we stay often two to three months here and it will be great to meet and mingle with other parents and kids in the similar situations. How can join the group?